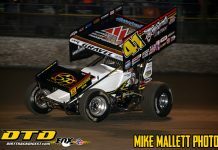 GIBSONTON, FL – The 42nd annual Winternationals at East Bay Raceway Park concluded with the running of the Ronald Laney Memorial King of the 360s and it was a familiar face beneath the crown who was holding the scepter. 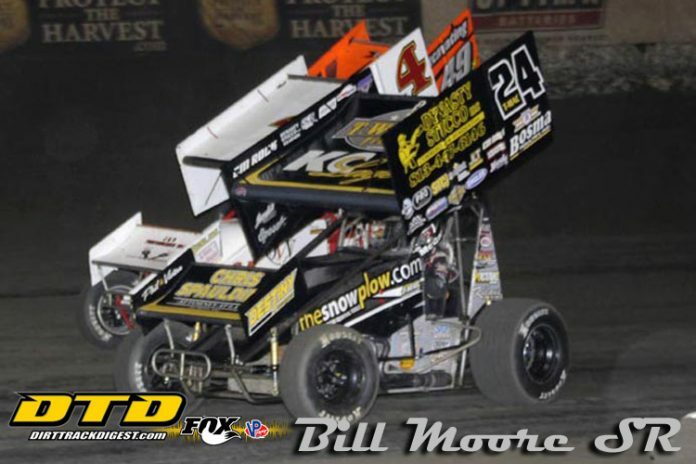 Iowa racer Terry McCarl logged his third title in the hotly contested event, utilizing his pole starting spot and mastery of traffic to claim the victory. McCarl added the 2018 triumph to victories in 2006 and 2016. 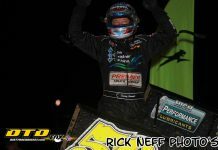 McCarl had scored a pair of fourth place finishes leading into the weekend finale, good enough to earn his place among the top six in points who locked into the 40-lap A Main. Prior to the drawing for starting positions, McCarl expressed a desire not to be the one to lead the field to the green, but a young fan reached down and pulled the number one position. McCarl would start on the front row with Pennsylvania’s Tim Shaffer on the outside. The first caution flew on lap one for a spin involving Danny Martin Jr. and Phil Gressman, who were both able to continue. On the restart, McCarl moved out with the trio of Thomas Kennedy, Mark Smith and Shaffer in hot pursuit. Another yellow for a four-car incident slowed the pace, but the field would endure a long green flag period that forced the frontrunners to mingle with lapped traffic. McCarl masterfully picked his way through, but could not build a substantial lead through the mid-stages. Shaffer darted past Smith and Kennedy to give chase from second. The final caution flew on lap 27, setting the stage for late race drama. Shaffer closed and caught McCarl going into turn one on lap 37. The pass did not stick as McCarl regained control on the backstretch and pushed on for the win. Shaffer in second was chased by Kennedy, Smith and two-time King of the 360s Wayne Johnson. 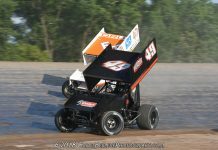 Robby Hoffman backed up his Thursday victory in the Mini Sprints with a strong run in the 25-lap main. Hoffman bypassed early race leader Whitey Kidd and darted through traffic to successfully hide from challengers. Kidd finished third behind Tyler Walton.